﻿The Royal Dutch Mint has issued two new commemorative coins to mark the Netherlands close relationship with the waterways systems throughout the country. One coin carries a face value of 5 Euros and is struck in silver, while the other carries a face value of 10 euros and is struck in gold. 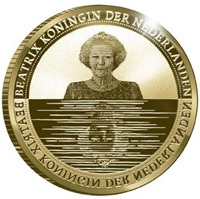 The obverse design features a frontal portrait of H.M. Queen Beatrix along with a reflective image beneath the main portrait including the text or legend of the Queen. 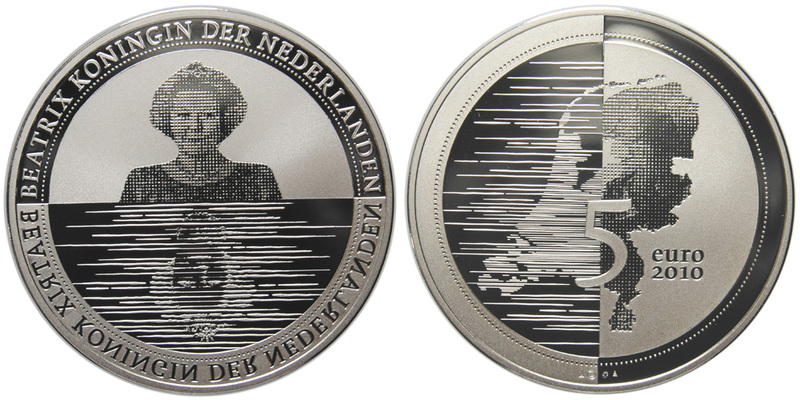 The reverse design shows a a geo-political map of the current boundaries of the Netherlands including the reclaimed land towards the coast, along with the coin’s denomination and year of issue 2010. The silver coin is struck in .925 and weighs 12.5 grams with a diameter of 33 mm. It is minted in proof quality and limited to 17,500 pieces. The gold version of the coin featuring the same design is struck in .900 with a weight of 6.72 grams and a diameter of 22.5 mm. It is also minted in proof quality with a limit of 4,500 pieces.